We come now to the conclusion of this great conference. 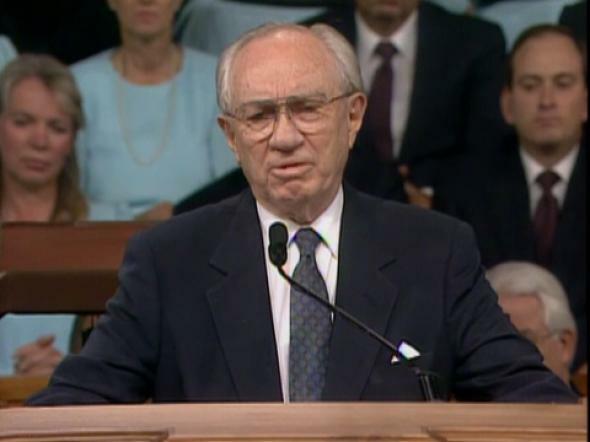 President Benson asked President Monson in the opening session to read a message from him, which was beautiful and inclusive and of great value to us. He has felt that he would not speak in this session. We commemorated President Benson’s ninetieth birthday last August fourth with a great celebration in this Tabernacle, which was carried to the Church across the nation and even to some foreign areas. His life has been rich and wonderful and marvelous. 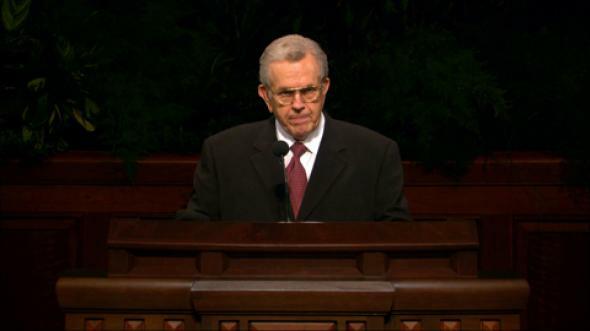 His service has been tremendous and unceasing. His love for the people has been deep and magnificent. I know that he would have me express in his behalf his deep love for each of you, for you members of the Church throughout the world wherever you may be; likewise, he would extend that love to those who are not members of the Church, for he stands as a prophet of the Lord Jesus Christ, extending in his life and in his authority as that prophet all of the love which the Lord would have his children receive. 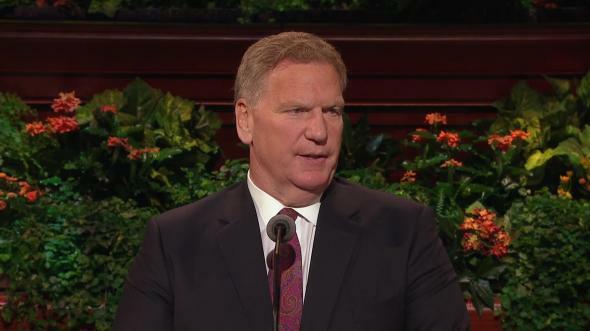 “We ever pray for thee, our prophet dear.” God bless you for your great leadership, for your dedicated service, for your example to us, for your love of God expressed through your service to His children. As we conclude this conference, we express our sincere appreciation to the Mormon Youth Chorus, the Polynesian Choir, the Tabernacle Choir, and their conductors and organists for their beautiful and inspiring music. May I say concerning this great Tabernacle Choir, which has sung for us today, that it has become an institution in the Church and has become, as expressed by a great national leader, a national treasure. They are dedicated and wonderful people, skillfully led and directed by good and able leaders, who sing the glories of God each week to a vast audience from sea to shining sea across this land and have been doing so for sixty years. 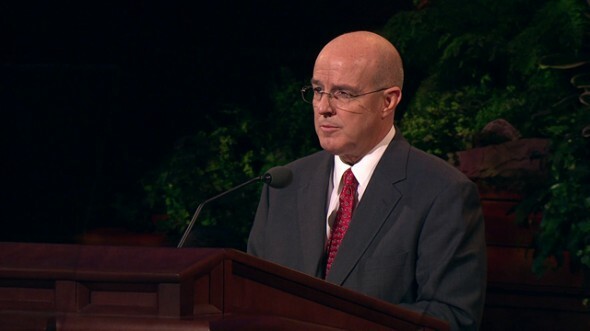 Last July that anniversary was celebrated here, again in this Tabernacle. Think of it—six decades without an interruption of singing as the Mormon Tabernacle Choir, representatives of The Church of Jesus Christ of Latter-day Saints. There is nothing like it in the history of broadcasting in this nation or in any other nation. They have now given 3,127 continuous programs, that number being the number of the program that was given this morning. We salute them. We honor them. We praise them. We thank them for their dedicated service and their unmatched contributions. The roots of this choir lie in the soil of this block. It was a hundred and forty or more years ago in the old Bowery first, and then in the old Tabernacle, which stood just to the south of us, that a group of singers first raised their voices in this valley in praise to God. The choir they began has gone on ever since and in the process grown better with age. Thank you so very, very much. We thank our city officials for the cooperation given this conference, the Relief Society, the doctors and Church health unit nurses who have been on hand to render service, and the ushers and interpreters. We express appreciation to local and national press representatives for the coverage of the conference. We are grateful to the owners and the operators of the many radio and television stations and cable and satellite systems who have given time and made facilities available to carry sessions of this conference in many countries. The choir will sing “A Gaelic Blessing,” and the benediction will then be offered by Elder Malcolm S. Jeppsen of the Seventy. The conference will then stand adjourned for six months. “See that ye love one another; cease to be covetous; learn to impart one to another as the gospel requires. “And above all things, clothe yourselves with the bond of charity, as with a mantle, which is the bond of perfectness and peace. Our prayers go with you. May there come into your minds remembrances of the wonderful things we have heard as we have sat together as the Saints of God and partaken of his everlasting truths, I humbly pray in the name of Jesus Christ, amen.